October 1, 2009 – Dallas-Fort Worth, TX – Even among rare, expensive, and exquisite automobiles, the Talbot-Lago T150c Cabriolet is a rarity, as well as a true benchmark of style and design. 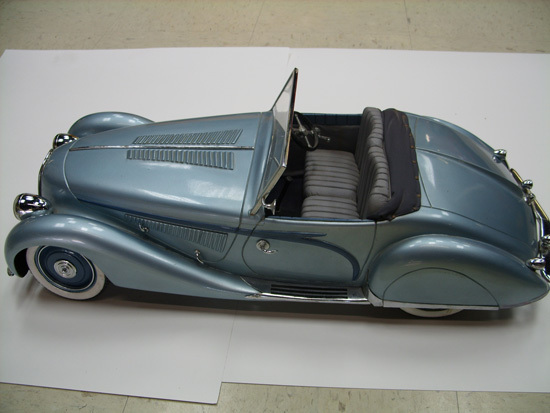 And the 23” long 1937 manufacturer’s design model recently acquired by DFW Elite Toy Museum in Ft. Worth, TX, is an equally rare and exquisite example of the art of the miniature. Hand carved from a single piece of wood – with etched joins and vents, chrome-plated accents, and precise replica interior, wheels, windscreen, and hardware – this design model for the 1938 production year T150c faithfully renders every detail of the Figoni & Falaschi concept, destined for a very select few among the European nobility and industrial barons of Jazz Age America. Because the Talbot-Lago is among that ultra-exclusive class of automobile that is usually (if rarely) sold via private treaty sale, comparable pricing can be difficult to establish, but recent sales of the ’38 T150c have been reported in excess of $3.5 million (US). Driving these numbers is the historic combination of Antonio Lago’s engineering prowess and the revolutionary hyper-aerodynamic styling of master coachmakers Giuseppe Figoni and Ovidio Falaschi. Making this particular model especially exciting are all the design developments associated with the ’38 model T150c, including the abbreviated tail, raised headlamps, open front wheels, and reduced drop between fender and hood. All of which makes this particular model something more than a fine example of the carver’s art – it’s also a genuine piece of automotive history. To view the piece, visit DFW Elite Toy Museum online or stop by the museum in person, located inside DFW Elite Auto Rental at 5940 Eden in Fort Worth. The museum is open from 9 to 5 on weekdays and 9 to 4 on Saturday.